Welcome to Twin Lakes Pet Resort & Spa. If you are looking for a special place for your pet’s boarding and grooming needs, look no further! Our highly experienced staff and family environment bring your pet a level of care above and beyond that of other facilities. Each member of our staff has 15+ years of pet care experience and believe that your pet’s health, well-being, and comfort should always be top priorities. You and your pet will feel like family from the first time you walk in the door. Our Resort is housed completely indoors. This allows for climate control and superior supervision. Our spacious 5’x4′ suites provide enough space for family members to stay together while at the Resort. Individual potty walks are every 3-4 hours in the grassy field to the north of the building, with each pet leashed in a figure-eight harness (a secure, no escape leashing technique). Daily playtime, either indoors or outdoors, is included for all pets during their stay. Our Spa and groomers are equipped to accommodate all breeds, sizes, ages, and temperaments of dogs and cats. Appointments are available through out the day for your convenience and to reduce the amount of time your pet is away from you. We use all natural products to help your pet look and feel their very best. Our groomers have also developed handling techniques that eliminate the need of muzzles, restraints, or sedation drugs. Walk-in services, such as nail trims, are available. If your pet is in need of veterinary services, such as a wellness visit or vaccinations, the doctors at our parent clinic, Twin Lakes Pet & Bird Clinic, would love to help your pet. 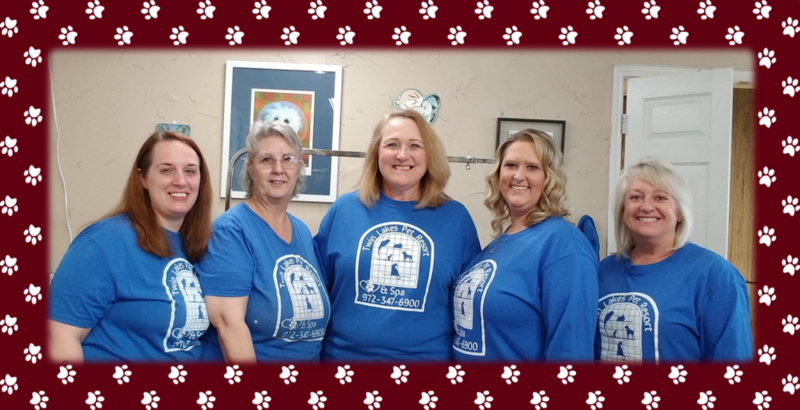 Twin Lakes Pet Resort & Spa is located at 26828 Highway 380 East, between Aubrey and Little Elm, across from Savannah.